A girl of a thousand voices, Christina Bianco is the stunning US vocal impressionist whose repertoire spans Edith Piaf, Barbra Streisand, Idina Menzel, Shirley Bassey and Ariana Grande. 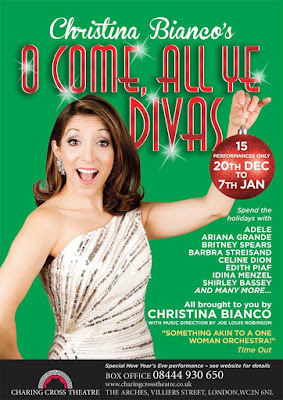 A star of Forbidden Broadway in New York and the West End, she will now premiere her special festive spectacular, O COME, ALL YE DIVAS, at Charing Cross Theatre for 15 performances from Tuesday 20 December to Saturday 7 January. Through soaring vocals and jaw-dropping impressions, O COME, ALL YE DIVAS features classic renditions and unlikely interpretations of favourite Christmas holiday tunes along with hilarious sketches and a fabulous on-stage band. Christina promises to take Londoners on a seasonal celebration like no other! Broadway and West End performer Christina Bianco’s singular voice and comedic charm has brought audiences around the world to their feet. Bianco captured international acclaim as a YouTube sensation with her ‘diva’ impression videos, gaining over 23 million views. She has performed on The Ellen Degeneres Show, The Paul O’Grady Show, This Morning and Graham Norton’s BBC Radio 2 show. titled, Me Myself And Everyone Else, earning 5-star reviews across the country.